Hey! You’ve landed at Winc, formerly Staples. We are a leading business supplies company in Australia. 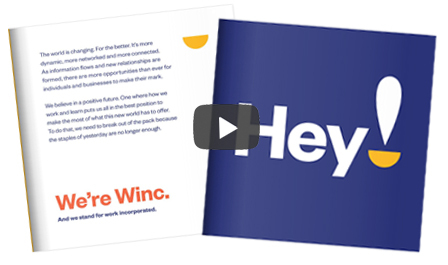 You probably heard through the media – our new name is Winc which stands for work incorporated. We’re still here to provide everything you need with over 100,000 products in the one place, tailored to you and yours and delivered to your desk. Check out our video below to learn more. Winc is a company that exists to inspire millions of people in Australia with new and better ways to work and learn. We believe that work should allow people to create more, learn more, play more and do more. Inspiring better ways to get things done. We’re here to give you the tools, environments and guidance you need to make the most of the world of working and learning – today and tomorrow. Because a new world comes with new expectations and new possibilities.